So, I love horror and I love short stories. Give me both in one book... let's just say this is going to be a good review. Oh-and I just checked-its still Free! Gear yourself up for some tortured tales that will have you flipping those pages rapid fire. Strange Portals has got you covered from vampires to werewolves, from pixies to leprechauns, from Santa's reindeer to Satan's limo. Take a tunnel to a bleak future Earth where people can't breath the air anymore and are getting ready to go to Mars. Witness an Indian ghost story that begets new life. Meet a man with the gift to heal others, but the curse of having his own life diminished with each act. Many more stories await you. 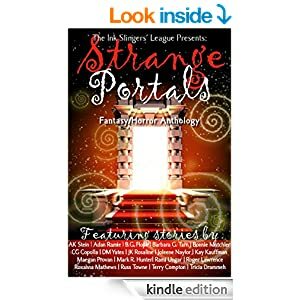 Two of the authors featured in Strange Portals are Joleene Naylor and D.M. Yates. I have reviewed books by both of these writers in previous editions of What I Am Reading. In addition to having two of her short stories featured, Ms. Naylor also is the editor of this anthology. If you love horror (and a bit of fantasy) as much as myself, then hurry up and grab your FREE copy of Strange Portals while the offer lasts. You will be glad you did. Horror and short stories? Love 'em. Great review! Thanks so much for the awesome review! I sent it to Bonnie and she said it "made her week". Needless to say, it made mine, too! Thanks everyone! :D Looking forward to your review Janice! And martin thanks for the cover compliment ;) I had fun with this one! I grabbed it! I will even write my own review on the book and put it on my blog! I'll let you know when its up Joleene and D.M.! Even if you are not ready to read it, make sure you grab it now while it is still Free! Horror and short stories! My cup of tea too. Just added it to my books to read list! Not sure how long Joleene is going to let this one go for free. So be sure and pick up your copy soon! Sounds an interesting mix of stories - and a great cover, too! I'll take a look.